If you're not interested in hearing about anything not related to veganism or vegetarianism, feel free to click off the page now. 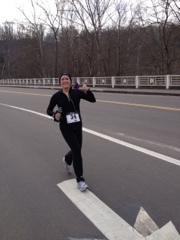 Last May, I ran in the Cleveland Marathon. It was my second attempt at running in the Cleveland Marathon. In 2010 I trained and trained and trained and trained for the full marathon only to get injured on my last run before the race. Not a 20 mile run, but a 2 mile run. It was really disappointing. I didn't even attempt to run in the because my ankle was so sore that I could barely put weight on it. I've been plagued with ankle injuries since I started running, but this injury was really devastating. So I nervously trained for the full marathon again in 2011. Determined to finish. No matter what. And finish I did! I took 15 minutes off my time and was floating on cloud nine once I finished. Or something like that. The weather was actually pretty awful last year, and I was drenched from rain and sweat and I kind of thought I had hypothermia. While I should have spent the day celebrating (after a nice hot shower) I spent the day on the couch. I cooked myself dinner and went to bed early. It was very anticlimactic. I didn't even get to wear my medal. The next day I woke up with a freakishly large left ankle. Weird. I wasn't really in any pain, but considering my ankle injury history, I figured I should get it checked out. I headed to my doc and got an xray. He suspected that I had a stress fracture but ordered an MRI to be sure. I'd been experiencing what I thought were shin splints the week before the marathon, but I thought it was just my head playing games with me. But in case you didn't know this, shin splints in seasoned runners can be a sign of a stress fracture. And the MRI confirmed that I had a stress fracture. I was crushed. My case was unusual according to my doctor since I didn't have any pain. And since I didn't have any pain, he couldn't justify putting me in a walking cast (I've had one before - it's miserable to have to wear one), he fitted me with a brace. A brace that I had to wear for the next 3 months. It was torture. I wasn't allowed to do anything more strenuous than bicycle at the gym. I work at conventions for work once in awhile and I was in the brace for our busy season. I have an awesomely unflattering pic of myself at the Hoover Dam from when I was in Vegas for a trade show and had to wear the awful brace. It hurts me to look at it. I visited so many places that have great trails, parks, etc., last summer and I couldn't even walk through them. But bad situations can't last forever, so I was finally cleared to run again last August. I was off my feet for over 3 months. I know people who wig out if they take a day off from running. Imagine how tough it would be to not run for 3 months. When I started running again, it was like I was starting to run all over again. I could barely run a half mile. I was slow as molasses. (and I'm actually a lot slower still - a full one minute per mile slower - I'm working on that) But I was running. I belong to an excellent running club full of super supportive people. Everyone gets injured at some point, so my running friends were really great during my downtime and beyond. While I was slowly ramping up, people in my club provided me with so much encouragement. They really "got" what I was feeling and gave my confidence a boost. If you're reading this and are a runner and aren't already running with a group of friends or people in a running club, I encourage you to seek out other like minded people. It's great to have people who are as "into" running as you are. And unless you're really lucky, most of the people in your life probably don't "get" running. You know the ones. People who think a 5K is the same as a marathon. Fast forward to March 2012. I've been slowly - very slowly - ramping up my daily run distance and my weekly run distance. I've had some setbacks. Life gets in the way sometimes. But I've kept my eye on the prize and was able to run in the Mill Creek Half Marathon in Youngstown this past weekend with a bunch of people from my running club. It wasn't my best time, and I made dumb mistakes before the race (you should eat a good dinner the night before so you don't bonk during the race - duh) but overall, I was very happy to have finished. Back in August, I didn't know if I'd ever be able to run a long distance again, and it was a great accomplishment to be able to run this far. Although I've run this particular half marathon a couple times (with bronchitis last year - I wouldn't recommend that) I'd say that this was my best race - not because of my actual performance but because I had supportive people there with me. My friend Erin ran the last half mile with me and really gave me the encouragement that I needed to finish. (Cuz I seriously did bonk. Remind me to never forget my Clif gel ever again) After the race I got to do something I'd never done before - celebrate with fellow runners! After a quick shower at my boyfriend's parents house (in Youngstown) we all went out and celebrated finishing the race. 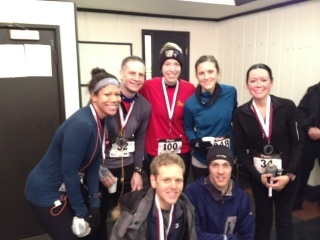 Most of us sported our medals and were really genuinely happy for each other for finishing the race. It was a great day. Don't take running for granted. It's easy to get injured. Next time you grumble about going for a run, think about what it would be like if you couldn't run. Be thankful for your abilities - but not at the expense of someone else. Whether you're a marathoner or training for your first 5K, we're all in this together. We've all struggled at some point. You may be better, faster, stronger than someone else but don't minimize their accomplishment if it's something that's "easy" for you. It's been a humbling experience for me to start from scratch again. Support your fellow runners. Whether you cheer on the sidelines, provide encouragement for a friend, or work at a water stop, it's great to support the greater running community. I couldn't have made it through my injury without my supportive running friends. Don't give up. Running is hard for most people. You're going to have good and bad days running. You're going to get discouraged sometimes. You might even get hurt. Just try to work through your bad days and enjoy the good days. Remember to have fun. I think I've lost sight of this a couple times when I've gotten too focused on my training. Try to enjoy your training journey and really celebrate your accomplishments.